Any talent I have for cooking flies out the window the moment baking bread is involved. While I can pull off any number of complicated dishes and sauces, if you give me a recipe requiring yeast, and it’s guaranteed to be a flop. As my husband and stepson can attest, I’m been trying to make my great grandmother’s pillowy-soft dinner rolls for years, and they turn out like hockey pucks every time. 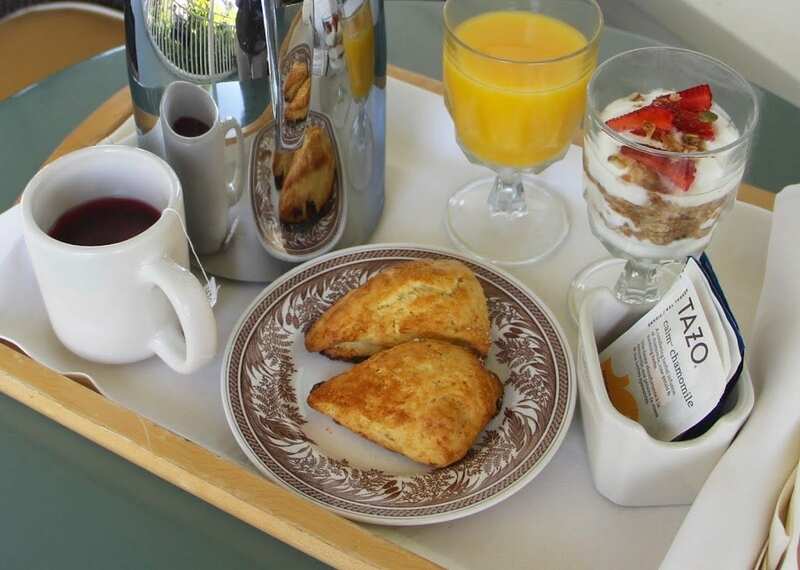 As such, I had shied away from bread baking in all of its forms until this morning, when I tried to re-create the delicious scones made by the Tallman Hotel in Upper Lake. The recipe looked simple enough, and mercifully, it contained no yeast. I mixed the ingredients, a little wary of the amount of salt required. 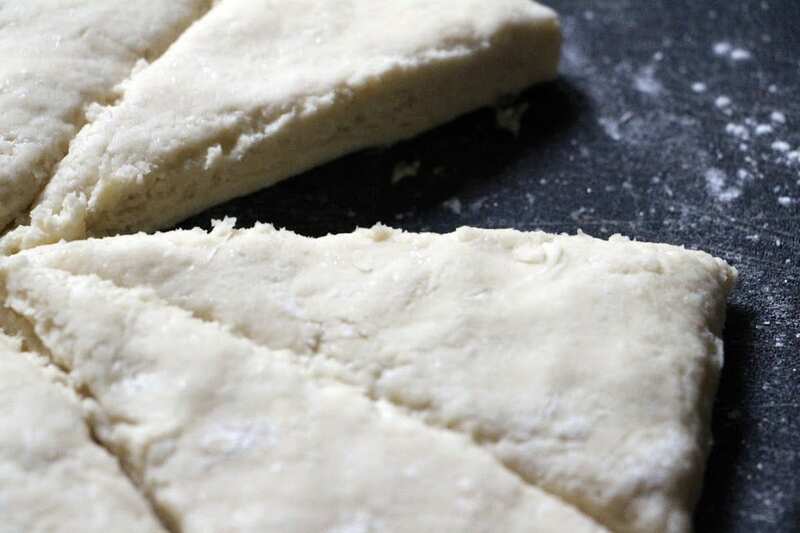 Then I kneaded the dough a few times, flattened it out, and cut it into the wedges for the scones. 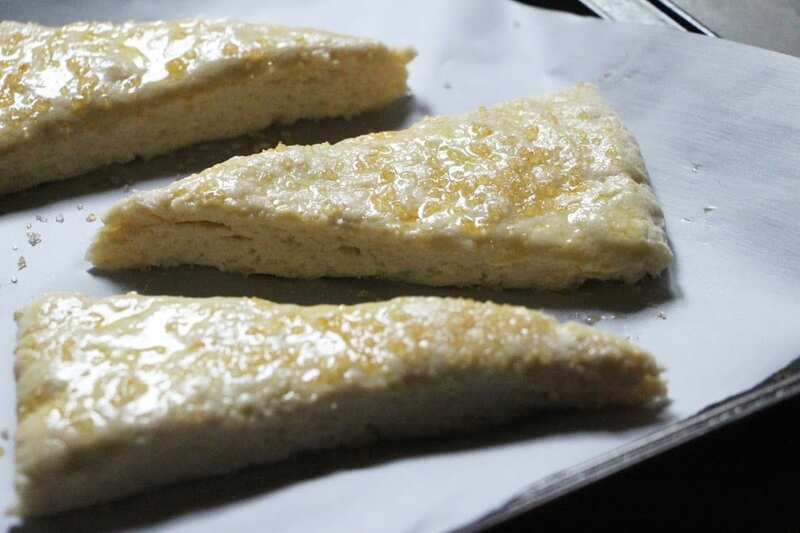 I brushed the scones with a beaten egg and then sprinkled the tops with raw sugar. Looking at the flat wedges on the baking sheet, I was prepared for another flop. But when I pulled the scones out of the oven 15 minutes later, I was in awe. They had risen and were surprisingly light–nothing at all like the hockey pucks I typically pull out of the oven. I broke one apart and popped a piece in my mouth. The balance between the salt, sugar, and cream was perfect. I pulled some strawberry jam out of the refrigerator and stood at the counter with a knife, devouring the warm scone topped with a bit jam. It was divine. My husband and stepson are going to be impressed. Blend together first four ingredients. 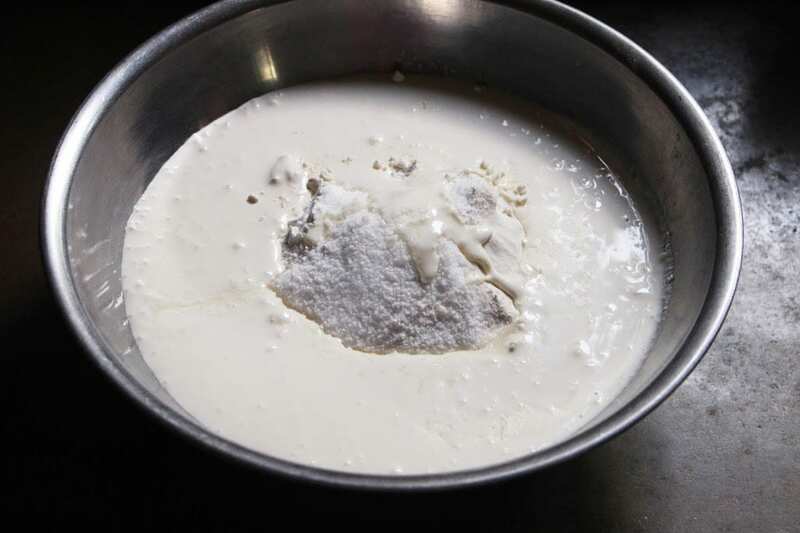 Add heavy cream to dry ingredients. Use your hands to mix the ingredients and gather then into a ball. 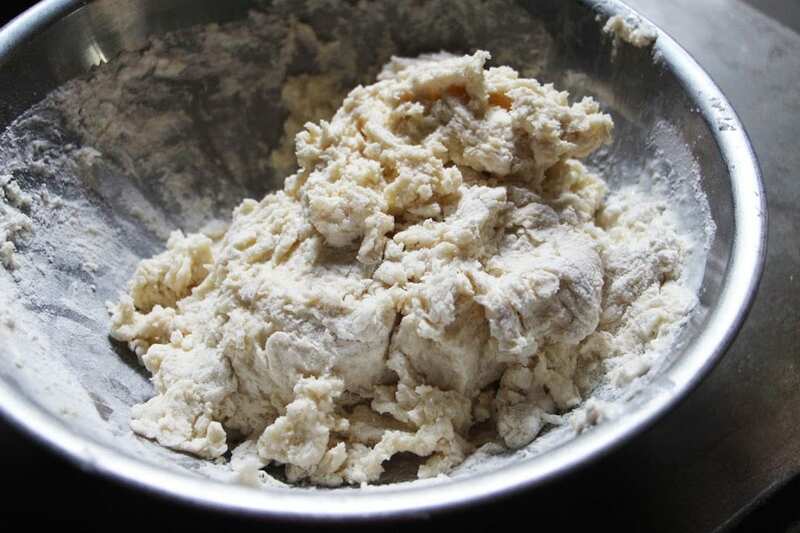 Place the dough ball on a lightly floured surface and knead dough a few times. 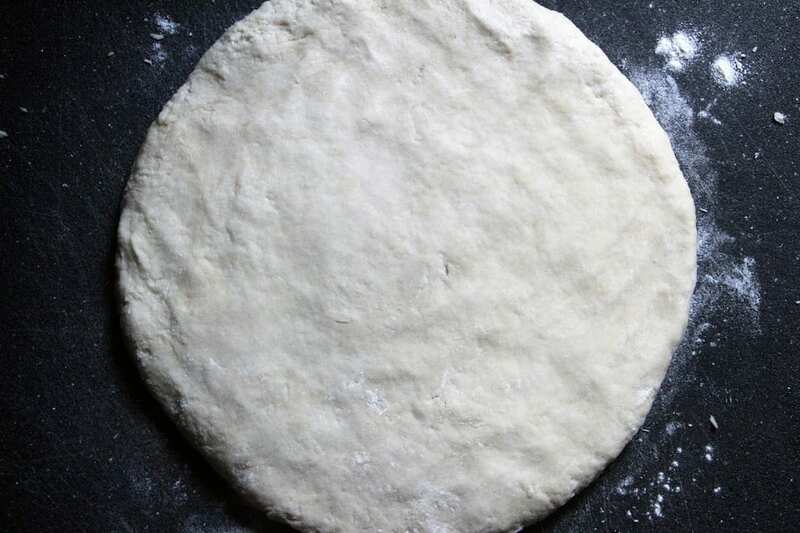 Re-shape dough into a disk about 10 inches in diameter and half an inch thick. Cut into the disk into 10 or 12 wedges and transfer to a baking sheet covered with parchment paper. Beat an egg with milk and brush the mixture over the top of the scones. 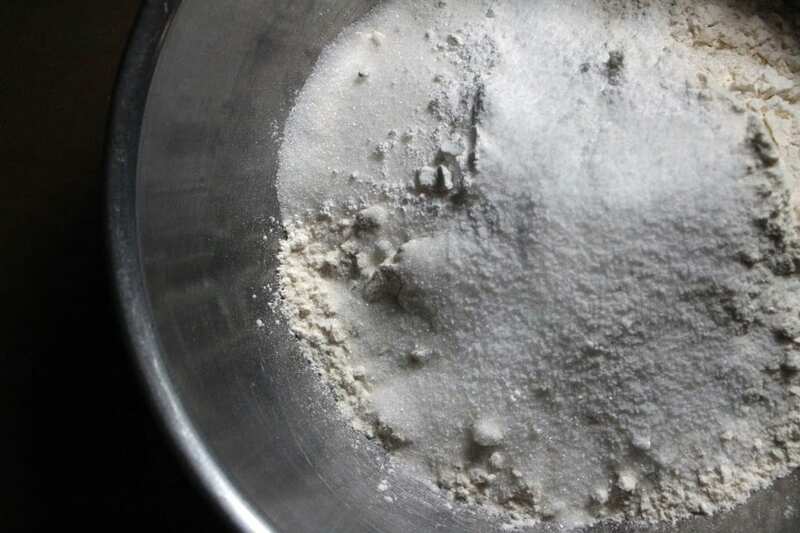 Lightly sprinkle the tops of the scones with raw sugar, if desired. Bake scones for 15-20 minutes or until golden brown. Cool slightly before removing from pan.